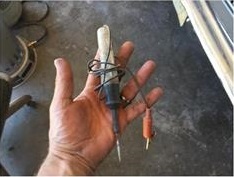 The process of locating a electrical short can be difficult, and time consuming. By using this simple test light method, you can narrow your search dramatically. This process will save you time and money. Here is how to find a short on most vehicle using a 12 volt test light. 1… Low voltage when trying to start your car. (longer cranking time). 2… Lights dim while cranking the engine over. If you have any or all of these symptoms, you could have a short. Now using just this simple test light, you can locate most shorts. First disconnect the ground battery terminal. Clip the end of the test light to the negative side of the battery. You may need to use a clamp to hold it into place. Second put the other end of the test light on the negative terminal wire. If you have a short, the test light will light up. 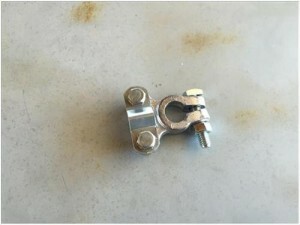 This picture shows the use of a second battery terminal being used as a simple clamp. Third, open up your fuse panel. Now one by one, pull a fuse. As you pull one fuse look at the test light. If the light stays on, replace that fuse. Then pull another. Again if the light stays on, replace that fuse as well. Continue pulling, and replacing your fusses until the light goes out. If you pull a fuse and the light goes out. This will be the circuit that will have the short. Look next to where you pulled the fuse. There will be a number. Let’s say the fuse you pulled out has a number 15 next to the holes, then the short will be on circuit 15. Now flip over your fuse box panel cover. After flipping over your fuse block panel cover, you will see the numbers in order. Locate your fuse number, in this case the circuit number 15. Next to the number 15 you will see the circuit name. An example would be, 14 tail lights, 15 cigarette lighter. So now we know, because the light that went out was fuse number 15, and fuse number 15 is the fuse for the cigarette lighter. 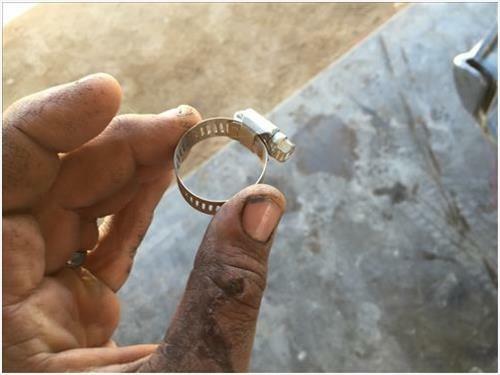 Therefore the short is in the cigarette lighter or the wiring for the cigarette lighter. Be sure to follow the wiring, looking for any melted areas on that wire, or look inside the cigarette lighter for any type of melting. This process will narrow your search from hundred of wires, to possible one wire in minutes. Some items that could cause a miss read are as followed. 1… Your door light is on. 2… Your radio clock is on. 3… Your key is on, or on the accessory (backwards key position). You can simply run this route backwards if any of these things stay on. Simply look at the fuse box cover and remove the fuse for those items, while performing this test. If the radio shows fuse number 26, then remove fuse number 26, until the test is over. Then replace it with the same fuse. When removing two or three fuses, you may remove a blue fuse ( 10 amp) and a brown fuse ( 5 amp) when removing multiple fuses it is mandatory they go back where they came from. You do not want a 30 amp fuse in a 5 amp location. To avoid this issue, either write it down, or simply take a picture of the fuse box before removing any fuses. So in short, disconnect the battery, connect the test light to the terminal and the battery. Pull fuses one by one, until the light goes out. Follow the fuse box cover number to the name of the circuit. Then follow the wiring, and replace anything that is melted. 5… Any wires that hang low around your feet area of the car. Use your 2 major senses when trying to locate the issue. 75 percent of your shorts you can locate yourself. Some mechanics will tell you that you should never disconnect your battery terminal because the computer will lose its memory. Do not be afraid to disconnect the terminal. The computer will reset. The computer will do so just as if your battery was bad and you needed to replace it. However you may need to reset your clock, and reprogram all your favorite radio stations. Do not leave a short, hoping it will go away. This issue can cause harm to your car, and yourself. Fixing a short keeps your family and friends safe, and makes a happy car. Remember if in doubt take your car or truck to a professional. 2005 gmc canyon has a short. I have pulled every fuse and relay out and cannot find it. Any ideas? Personally, I believe I need to give you a sort of 5-stars in such a detailed explanation on finding and fixing an electrical short like this. I may not be a mechanic but I was able to follow your discussion, awesome! And yes, I will keep in mind that we need to look and smell in order to identify or determine the electrical shorts. Worked a treat. Managed to eliminate any possibility of a ‘short’. Confirmed my battery was the main problem. Tested the battery CCA. Didn’t want to replace the battery without ensuring the faulty battery wasn’t as a result of a power leak. 07 Saturn vue,did all the fuses light still on. 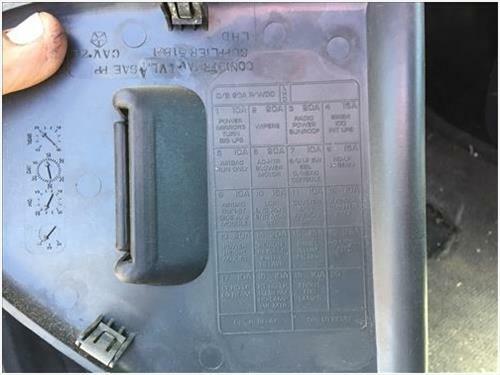 There also may be another fuse panel (Buick rendezvous had one under the hood and one beside left leg front passenger compartment). its the main feed (possibly on or near the starter), or another fuse panel. Possibly, the panel harness wiring clip is faulty or the electronic engine controls module is at play. The eec, or engine control module as it is called in some parts of the world, is your vehicle’s brain thus, the relay for it or the module itself could be responsible. Unplug things and plug them back in, first as it may be a loose connection. If not, get out a multimeter and circuit tester light and track the culprit down. Thanks for this. Great job of laying out a method to solve an issue. I’m working on my ’08 Jeep Wrangler since the hazards, ESP switch and dome light shut off, and keeps blowing the fuse for this. Some earlier repair work on my water pump and brake system by an auto shop MAY have crimped or damaged something else along the way to cause this so I have to explore this fuse-by-fuse (which i’m glad to do since my local dodge dealer’s service dept is not thrilled with working on Jeeps). But I’ve searched for tips on this, and your explanation is clear and makes perfect sense to someone who has no electrical background. Nice job, really! Hi, I would like to thank you your advice. Finally, I found the problem that I have in my car. The short showed when I removed the fuse that said “Trans” 20 amp. Probably, it is the ground that the mechanic that replaced the transmission forgot to connect. B.Thomas I just watched your video. I have a 1996 Toyota Corolla with the 1.6 liter 4A-FE engine. The car set for a long time. I replaced several parts on the car. I finally started it about a month ago. It fan good, but then my check engine light came on and the car shut off. I tried to start it up again and it would not start. I thought the fuel pump was bad. I replaced the fuel pump and put a new fuel filter on. I also replaced the fuses for the ignition. I also replaced the distributor cap and rotor. The car is still blowing the fusible link every time I put it in the on position and will not crank. Can you tell me what you think my problem is? did u check the spark plugs? which fuse is it blowing? you have a short that blowing the fuse. sounds like since it sat for awhile. Some rodents chewed on the wiring. …. 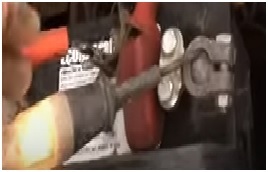 a wire may have been near some part of the engine or exhaust to be melted once the car heated up? I just tried to put a new radio in on a 2001 Toyota Corolla and after I got the new radio in and everything was hooked up, he radio and clock would not turn on so could this be a short? Great video, that said quick question. I’ve got a 2001 Passat and when the vehicle is completely turned off and the key is taken out the left signal indicator remains on/lit and also the left side marker remains on. I changed all of the bulbs and actually added a front headlight which was needed. Any thoughts??? I did the test as well on both terminals, negative and positive sides and light remained on every time i pulled a fuse..
pulled fuses light stays on. any suggestions? I followed a video where positive terminal of the battery was used for testing short. The battery is showing 11.4 V. The short test also shows 11.4V. At first I removed one fuse at time. Didn’t find changes. Then, I removed all the fuses, still the multimeter shows 11.4 V.
The problem occured in my car after I changed the aux cable in stereo. When I turn the key, the hazard light, dasjbaord lights and headlight starts blinking rapidly. If I try to ignite the engine, then I hear cracking sound. Then, door lock doesn’t work. Door lock starts working after I remove the battery terminal and plug back again. The only thing that works in the car is stereo. Any suggestions will be highly appreciated. Thanks for the video, it has given us a direction to pursue. We tried to remove the Fuses one by one and the light never went out. We decided to remove all of the Fuses and work our way backwards, but once all of the Fuses were out we are still getting the light. What would you suggest as a next step? Pull the positive cable off the battery while it is running. If it continues to run we need to check the starter for a current draw. If the truck dies. We need to change the alternator. Thanks for viewing. Very nice video after running the test I found several confusing issues, #1 the tester never went out completely, #2 the driver door switch seems to have short issues, #3 the aftermarket viper alarm is definitely and issue, #4 Courtesy fuse made the test light go real dim but not completely out. 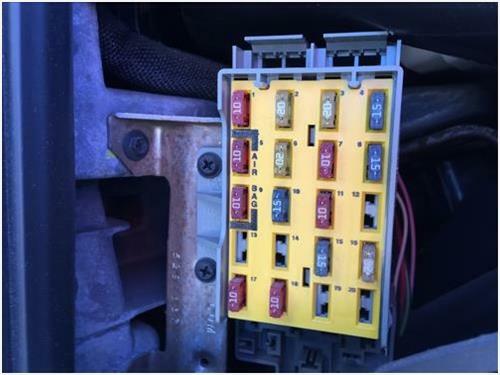 so I will trace the courtesy from the fuse box to the inside if the truck, I own a 1999 chevy silverado ext cab 5.3l, with serious HVAC issues, I ran across this short issue shortly after installing the viper alarm, the truck has been to the audio shop at least four times to reset or rewire the alarm system because each wire they use to setup the alarm using the body control module wiring harness the alarm always went haywire causing another visit to the alarm shop, next week I m removing the alarm one wire act a time and reset my factory alarm, anyway thanks for the video and keep up the excellent work. Awesome comment. Thank you for taking the time with your kind words. Boy I sure would check behind the fuse block with all those issues. Thanks again. Enjoy !! great videos. I have problems . high beam fuse and DRL fuse blows with headlights on high beam. but plug each headlight in by its self , fuses don’t blow . 08 Hyundai Tucson 2.7l. Check the fuse panel directly behind the headlight highbeam fuse. 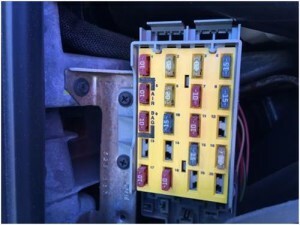 It sounds like the wires may be melted there, if they are not then change the high beam switch it is faulty. I’m guessing that if the short is not behind the fuse panel , then it’s in that switch. They are simple to replace and cost around 50.00. Good luck. Please let me know what you find out. ( I would not waste your time chasing wires yet. It’s almost always the panel or the switch ). Some people like hanging things off that switch. ( I believe yours is to the left on the column ) that little xtra weight will pull down on the switch causing the other end to push up on the metal of the column. Thus grounding it out. And popping fuses. Thanks for your comments and question. Thank-you , B Thomas for replying to my problem. fuse box under hood almost impossible to remove without scraping these new cars . will try switch and let you know how things went. not like the old days. By the way, GREAT last name ( THOMAS ) same has mine. Super helpful! Keep these comin.